Beautiful and luxurious stone house in the center of Carcassonne, with 4 bedrooms and 3.5 bathrooms - perfect for large families or groups of friends. The traditional 2-story design from the 1860s has been recently updated to offer the best of both worlds. Maison Juliette spans 290 m2 (3000 sq.ft.) of living space. The ground floor includes a newly remodeled kitchen that is fully equipped for gourmet cooking, a dining room that seats 10, two living rooms, plus a half bath. The upper floor includes 4 bedrooms with fireplaces and 3 full bathrooms. Three of four bedrooms can have either single or queen beds. The house sleeps 9 people, with a flexible mix of single and double beds, and no sofabeds. A freshly landscaped garden offers a beautiful oasis where you can enjoy the outdoors in privacy. The summer kitchen and garden dining area provide a casual and comfortable setting for enjoying meals outdoors. The Cité is a 1km walk to the east, and the commercial centre of Carcassonne is a 500m walk to the west. Experience a different kind of holiday - luxury in the center of a lively city, an easy walk to everything. Carcassonne area golf & ski: Carcassonne is ideally located in southwest France, only 45 min. from the Mediterranean beaches, an hour and a half from the Pyrenees ski resorts, and an easy 3-hr drive to Barcelona, Spain. Most of the ski resorts of the Eastern Pyrenees are easily accessible from Carcassonne: Font Romeu, Les Angles, Andorra and Ax-les-Thermes. Situated close to the medieval town, the Carcassonne Golf Club well deserves its reputation as a course of international standard. The 18 hole course totals 5800 meters (6280 yds), with a par of 71, and is open all year round. Carcassonne water sports, cycling and motorcycling: The Aude River, only 100m from Maison Juliette, offers great kayaking. Several companies offer white water rafting and canoeing trips. Lac de la Cavayère is a small recreational lake just 6km from Maison Juliette. With its sandy beaches, lifeguard-protected swimming areas, fishing, picnic areas, grass walking paths, this lake is a true haven of peace, freshness and delight. Carcassonne is a wonderful area for bicycling. In fact, many world-class cyclists have chosen to make their home in the area between Carcassonne and Barcelona. Two of the owners of Maison Juliette are cyclists, so please contact us for suggestions on cycling routes in the area. If you prefer two-wheeled touring with an engine, there are many wonderful motorcycling roads in the area. Three of four owners are also motorcyclists, so we'll be glad to offer you our route maps. Local events and festivals: Every year, Carcassonne hosts several major festivals - Jazz Week in April, the Festival of Music in June, Festival of the Cité in July, fabulous fireworks on Bastille Day (July 14), Spanish Week in August, Nautical Jousting in September, and a Christmas Festival in December. We wanted a vacation home in the center of a small city - walking distance shops, restaurants and tourist sights - so we could relax and experience the European pedestrian-centered lifestyle, and our teenagers could be independent but still safe. Carcassonne is friendly city with about 50,000 residents. The Cite is the largest restored castle in all of Europe, attracting three million visitors each year. Carcassonne is far enough south that the weather is temperate all year. The beach is only a 45-minute drive away - unless you count the lake, which the locals call 'Carcassonne Beach' :-). Walk to everywhere! And if you really want a rental car, there's plenty of free on-street parking directly in front of the house. toilet, Memorable tile floor & wallpaper in this half bath! toilet, combination tub/shower, bidet, Double sinks. Blue & green bedrooms have doors to this BA. The ground floor has a half bath (WC) for convenience. The upper floor has three full bathrooms, all remodeled in 2016 or 2018. The master bedroom has private bathroom with large tiled shower. The smallest pink bedroom also has a private bathroom with tiled shower and separate toilet & sink. Finally, there is a large full bath that is shared by the blue & green bedrooms, which includes double sinks, a bidet and tub/shower combination. Radiators in every room, with individual thermostats. Inside laundry room provided for guest use. Inside laundry room provided for guest use. We also provide a clothes drying rack. Total of 7 fireplaces, all now decorative only. Plenty of free unlimited-time parking available on the street in front of the house. Unlimited high-speed internet. USB printer that supports printing from IOS and Android mobile devices. High-speed internet throughout the house, with multiple WiFi repeaters. Two living rooms - a more formal salon (with TV) and a more casual library (with desk and bar). Two refrigerators: American-sized refrigerator in kitchen, plus undercounter refrigerator in summer kitchen. Two-burner gas cooktop plus two-burner electric cooktop. Kitchen includes standard oven, steam oven and microwave that can also function as convection oven. Built-in undercounter microwave also doubles as a secondary convection oven. Automatic drip coffee maker with gold filter, plus French press. We also have an electric kettle for tea lovers. We stock basic cooking ingredients: oil/vinegar, salt/pepper, spices, etc. Plenty of dishes & utensils for up to 12 people. Dining room table has two removable leaves, and so can adjust in size from 6 to 10 people. We have an iPod stereo - bring your iPod so you can enjoy your favorite music. We also have a traditional stereo with CD player & radio. We have a collection over over 100 DVDs - American and French movies, plus some children's movies. Over 100 books in English (novels, travel books, historical fiction), plus a few French classics. Chess/checkers, backgammon, cards, and the Carcassonne board game (of course :-). Music library of about 100 CDs, mostly American bands from the 70s and 80s. Board games and a deck of cards provided for a rainy day. Video library of about 200 DVDs, mostly English-language films, some French films with subtitles, and a few children's films. South-facing walled garden is a great place to relax and enjoy the sunshine. Kayak rentals available just 15 minute drive from house: 18 euros for 3-4 hour (9km) trip. Rental bicycles available at local bike shop (1km away) for only 10-15 euros/day. Boat rentals on Canal du Midi are available nearby. A glass-top dining table under wisteria arbor seats 6, and the bistro tables & chairs seat 8 more. Terrace also has 4 teak armchairs, a coffee table, and large offset shade umbrella. Golf de Carcassonne (18 holes, 5800m) is only 7 km away. Public swimming pool is about 1km away. House has 12 foot (4m) ceilings throughout. Mosaic terrazzo floors on the ground floor; original wood floors in the rest of the house. Wonderful curved wooden doors in library and green bedroom. Double-glazed windows throughout, so house stays cool during the summer and warm during winter. What a perfectly configured house for a big family or group of friends. The common areas downstairs are roomy - with an especially excellent kitchen and local market days - and the bedrooms, bathrooms and toilets are well configured and private. Location is great for walking around town or up to La Cite, and easy to get out of town for day trips. Thanks, Mark - we're glad you enjoyed your stay. You're welcome here any time! Carcassonne is the ultimate French experience and no small part of this fabulous holiday was the accomodations. Maison Juliette is a stately manor estate that offers the rare combination old world charm and current day convenience. I felt like I had both stepped out of time into the magical place of a historic storybook and sophisticated convenience. The home is located perfectly between downtown and the cite and walking to every amenity is easy. I would not have changed a single thing about this delightful, happy, warm, oh so enchanting property. Thank you for your kind words, Karla. We are so glad you enjoyed your stay at Maison Juliette! We arrived after a beautiful drive from Toulouse. And as we walked into the home were thrilled with the vibe of the house. We walked straight through to the garden and set down to decompress. It was everything you would imagine a French home to be. Plenty of rooms. Great kitchen and everything you need to create a meal after shopping in the market place down the street. We loved waking down the street with the little French shopping cart and felt like a typical French woman going to market to get our daily supplies. The house is very central to everything in Carcassonne and you really don’t need a car as everything is walking distance. But it was also great to have one as we did many drives to nearby beaches and wineries. The castle is a brief 15 minute walk and is amazing to experience It is now my favorite place in France. The people are very laid back and the countryside is beautiful. Maison Juliette will not disappoint. And highly recommend this home for a stay in a most beautiful area of France! Valérie, so glad you enjoyed your stay! We hope you'll come again some day in the future. This house and the surrounding area takes you back to another time. The house itself is comfortable, updated where needed, and provides enough room for large families or a cozy couple. We took daily walks along the river that is a block away; we walked to dinner in the walled city only a 15 minute walk and explored the countryside on rented bicycles. We even found a four star Michelin restaurant ina small town while exploring! Add to all of this a great bakery with fresh croissants four blocks away and we were in heaven. We can t wait to go back and explore even more! Excellent vacation home for our family! We loved our visit to Carcassonne! The house worked well for our large group and we enjoyed being able to walk to restaurants and shops in town without having to drive. We brought our 2 year old granddaughter and having a kitchen to cook and a closed in yard for her was a blessing. We would love to come again! We especially enjoyed how largeand comfortable the rooms are, and the high ceilings. We were very surprised how cool the house stayed! The property is very clean and spacious and superbly maintained. The kitchen is well stocked with every utensil and cookware needed for any type of meal preparation. The home is modern in its utilities, but still keeps its old time French charm. The home is tastefully decorated, yet comfortable and maintains a "homey" feel. The outdoor patio and garden is a great place to either relax or eat a meal. The neighborhood is quiet, well kept and friendly. The location is within walking distance to numerous restaurants and shops and only 5 blocks from a quaint family run bakery. This bakery was a daily morning stop for our group and definitely was an excellent way to start our morning. The home is just a short walk to a 13th century castle and is a definite "must see" for anyone staying at Maison Juliette. Our week long stay at Maison Juliette was incredible and I would 100% recommend this amazing place to anyone. To see our annotated Google map, first do an internet search for "Maison Juliette Carcassonne" to find our custom-built web site. Then click on Location tab to see the map. 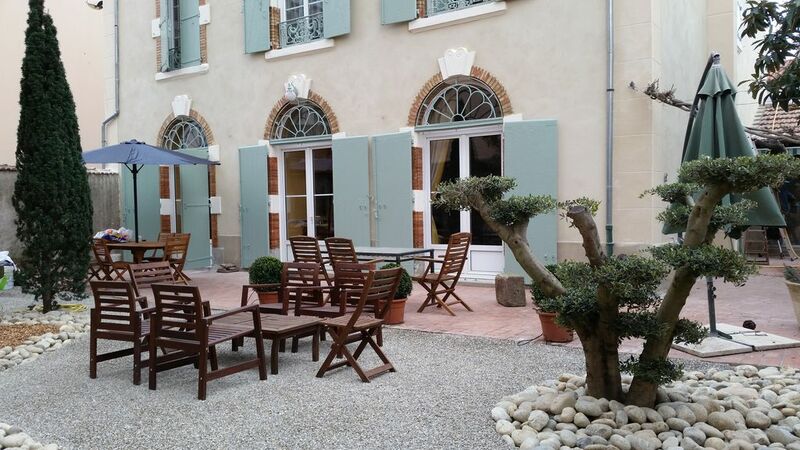 Maison Juliette is situated in the heart of Carcassonne, midway between the medieval walled Cité and the Bastide St. Louis, Carcassonne's commercial center. No car is required - enjoy a different kind of holiday in the centre of a lively city. • The riverbank, with its beautiful walking paths offering views of the Cité is only 100m from the house. • Numerous restaurants and bakeries are within a 500m walk. An internet cafe is within 300m; the post office is 400m, and several ATMs are within 500m. • The Canal du Midi, which runs from the Mediterranean to the Atlantic, is also just 500m from Maison Juliette. • There's a small swimming lake (Lac de la Cavayère) just 6 km, with lifeguard-protected swimming area, picnic tables, volleyball courts and zip lines. 1) Fly into Carcassonne airport on RyanAir (UK's budget airline) from Brussels, London/Stanstead and many other UK cities. 2) Fly into Toulouse and take a 1-hour train to Carcassonne, or simply rent a car and drive. The Carcassonne train station is 700m from the house. If you arrive by train with only a small rolling bag, you can easily walk to the house, or catch one of the taxis that line the street in front of the train station. 3) Fly into Barcelona and take a 3-hr train (or drive) to Carcassonne. 4) Fly into Paris, stay a few days to see that beautiful city, and take the 5-hr TGV (high-speed train) to Carcassonne. 5) Combine strategies 2 and 4 - you can often fly into Paris and out of Toulouse (or vice-versa) for about the same cost as a round-trip. Then just take the TGV one-way to/from Paris. Discount of 30% on stays of 7+ nights, so rate is same for 5-7 nights - relax in one spot and take day trips. Additional discount of 200 €/week offered for second and later weeks - Carcassonne is a great base location for a long stay in the south of France. Payments via credit card, bank transfer in euros, or checks in USD.